The Toronto Raptors have reportedly traded power forward Jared Sullinger and two draft picks to the Phoenix Suns for small forward P.J. Tucker. Masai Ujiri rejigged his roster in a way he believes will give the Toronto Raptors a fighting chance right now. The Raptors were among the busier teams ahead of Thursday afternoon's NBA trade deadline, as Ujiri traded for P.J. Tucker virtually at the buzzer, a week after he acquired Serge Ibaka. "Hey, let's do it 'till we fail," Ujiri said. "I think this team, the coaches, the players, the fans, the organization, I think they deserve it," Ujiri said. "You know what? If we gave it our best shot, we gave it our best shot. "I think the way the East is situated, there's Cleveland at the top and then I think there's five, six, seven teams that could catch steam at any time, and momentum, and it's whoever does at the right time, then maybe you find yourselves there. We want to give ourselves the best shot to be there." Ujiri acquired Tucker, originally drafted by the Raptors in the second round in 2006, from the Phoenix Suns for forward Jared Sullinger and two second-round draft picks. He brings instant grit to a team that could use it with 25 games to go, and fighting a slump that has plagued them for weeks. "Toughness. I love his toughness," said Ujiri, the Raptors' president. "He can defend. He can defend multiple positions. He can shoot the corner three. "Toughness," he reiterated. "We needed to become a tougher team and I think this helps us. Grit, just play ball. I love that about these two guys added to the guys that we have. I think it helps us with toughness." Toughness is definitely what the Raptors needed to have a fighting chance against LeBron James and the Cleveland Cavaliers. "I don't know if there's anybody that can deal with that guy (James) but you know, you try," Ujiri said. "At least we feel like you have to put guys on there that are going to try and I know he's going to try. I know DeMarre Carroll is going to try, I know Ibaka is going to try, I know Patrick Patterson is going to try. You want to put yourselves in the best position." The 31-year-old Tucker played 17 games for Toronto in 2006-07 before being waived to make room for Luke Jackson. He spent the next five seasons in Europe before catching on with the Suns in 2012-13. 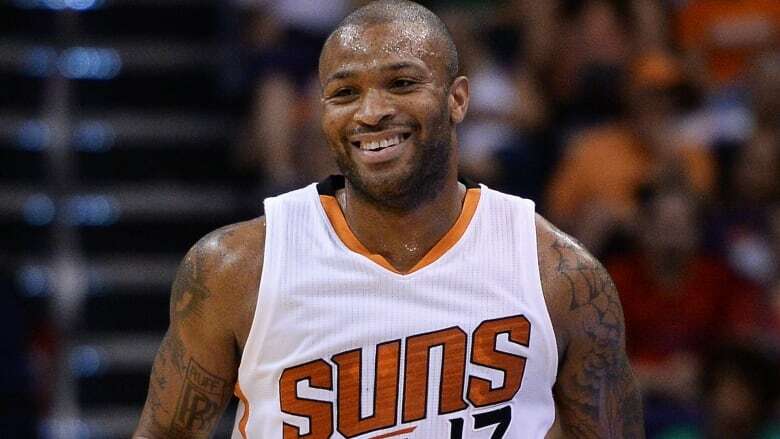 He's averaged 8.0 points, 5.9 rebounds and 1.2 steals a game over five seasons in Phoenix. Sullinger was signed to a one-year contract by the Raptors in the off-season, but he injured his foot in Toronto's first pre-season game and has appeared in just 11 games this season. Ujiri made the deal virtually within minutes of the 3 p.m. deadline, and then went to his daughter's ballet class while he waited for the required phone call with the NBA's head office to sign off on it. He said he would have been "comfortable" letting the deadline passing by without making Thursday's deal, but that "I think these two guys make us a little bit better, we hope. "Everything always looks pretty on paper. Now we have to go out and play and execute. I'm not a big trade deadline guy to be honest because I like training camp, I like preparation, and all of that. With this, I think we needed it." Ujiri said Tucker was scheduled to board a midnight flight from Phoenix. He was uncertain whether the new Raptor would play Friday night when Toronto hosted Eastern Conference-rival Boston.